Because Sites@Duke uses Duke NetID, you can easily add other Duke people. 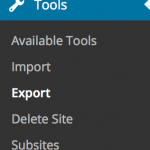 If you have a website on dukegroups, you can quickly get started by exporting it from there and importing it to Sites@Duke. 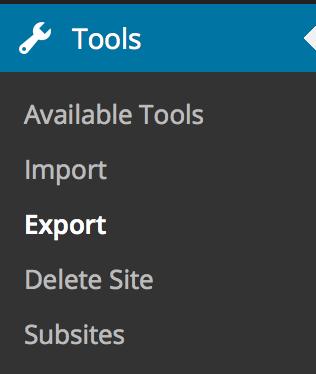 To do so, go to the dashboard > Tools > Export/Import. have a private sub-site for executive members only to facilitate collaboration and share administrative updates. Make sure to add your club advisor as an admin, so that they can always help the new executive members gain access to your site. Only upload your most important files to the site (e.g., logo, constitution, special graphics). If you need to store and archive a lot of files, consider using Box (box.duke.edu). For pictures, you can use Flickr and add the pictures to your site using the SlickrFlickr or FlickrPhotostream plugins. For videos, you can setup a YouTube account for your organization. The Share Buttons by AddToAny plugin makes it easy to enable visitors to share content from your site. You can use the My Calendar plugin to manage and share your events. You can also add your events to calendar.duke.edu, and then build an RSS feed that you will publish on your website. Alternatively, you can try to embed a Google calendar into a page. You can consult DiDA for advice and help on designing your site. Remember that Sites@Duke is updated throughout the year and you can submit requests for plugins that you would like to see included in the future.